The Walla Walla Valley Chamber of Commerce has been active since 1875, with over 700 members representing more than 10,000 employees throughout the Walla Walla Valley. The Chamber is committed to its members and is dedicated to serving their needs by offering strong programs and events. The Chamber prides itself on its strong staff and the incredible leadership provided by its Board of Directors and volunteers. The Chamber serves as the catalyst for the Valley’s community development efforts. It acts to unite hundreds of private and public sector professionals and officials and coordinates their efforts to enhance and maintain a vibrant business climate in the Walla Walla Valley. The Chamber is a community of people who realize that through their collaboration as a group they can accomplish collectively what no one person can do individually. 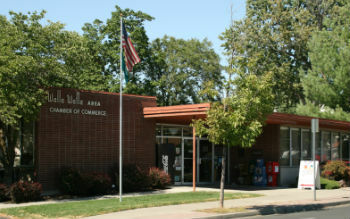 The Walla Walla Valley Chamber of Commerce is recognized as the number one business advocate in the Walla Walla Valley. The Walla Walla Valley Chamber of Commerce is a member-focused organization and community partner that fosters a sustainable, healthy and vibrant economic environment through business promotion, advocacy, education and services. The Chamber works to represent the interests of its membership and promotes the Walla Walla Valley as a thriving community and a great place to live, work, shop, play, visit and invest. Its program of work is designed to capitalize on opportunities to enhance the community’s quality of life: education, economic development, government, culture and other important factors. The strength of the Chamber lies in its members’ investments of time, energy, talent and financial resources. Because the Chamber embodies the vast expertise of a diverse membership, it has the knowledge and insight to identify issues and opportunities of importance to its membership and the community—and the combined means to devise and implement strategies to address them.